For P-Touch® GL100*, 200, 300, 310, 320, 330, 520, 530, 1000*, 1090*, 1180*, 1200*, 1230PC*, 1250*, 1290*, 1500PC*, 1700AD, 1750, 1800, 1830, 1880, 1900, 1950, 2030, 2100, 2200, 2300, 2430PC, 2500PC, 2600, 2700, 2730. *Not compatible with 18 mm (3/4") or 24 mm (1"). Red on White. 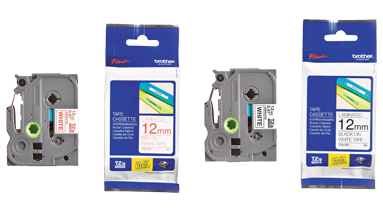 26' per tape. 12 mm (1/2).